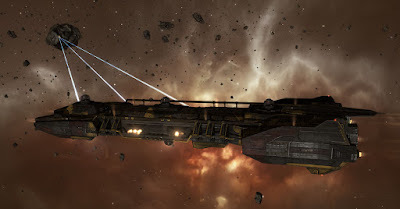 [Future] Rorqual Astrahus citadel docking fix]. This has not been received well. Serious miners: Suggest you post on the threads and contact anyone you know on the CSM. What CCP proposes to do with the Rorqual and Orca will not be a benefit to miners or mining. It will benefit PvP gangs by providing more soft targets. Mining assets are already very much at risk. POS boosting was the main thing that made that risk worthwhile. On a brighter note, collected all 58 of the Purity of the Throne event SKINs. Will probably put the set up on contract. Have many extras for my Amarr pilots. It's early morning September 13, 2016. In about six hours the Eve Online Exhumer known as the Hulk will change. New artwork, new specs and the loss of one of its three Strip Miner high slots. 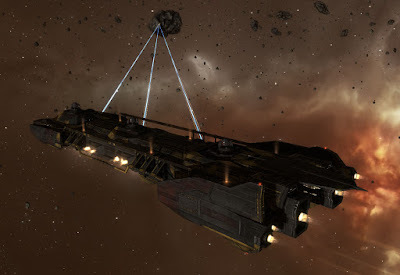 Apparently, a Dev back in 2012 made a note that the next time the non-frigate sized mining vessels are updated they should all have the same number of Strip Miners - two - and CCP felt this was reason enough to drop one from the Hulk. Forget the fact that three Strips make for better mining. Shots of the new Hulk look can be seen here: Eve Online Mining: Mining Barges and Exhumers will change in September, 2016. Frankly, the new artwork is sweet, especially with the new SKINs, but many of us miners will lobby for the return of three high slot Strip Miner hard points. Below are screenshots taken today to celebrate the passing of the three-Strip Hulk. 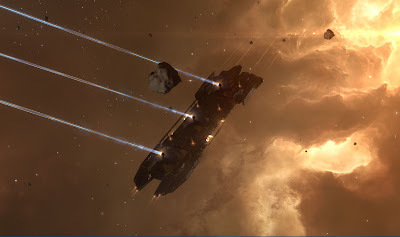 Eve Online Mining: End of an era? That sums up what follows about the upcoming changes to Eve Online that will affect mining. Consider me a union rep for multi-boxing miners. CCP has decided, and we knew it was coming well in advance, that all boosting should be done on grid. Turns out, not only on grid but within relatively close proximity to the boosted ships. With the new extended grid sizes there was some hope we could park the Rorquals at the edge of the grid, fit a cloak, and hunker down if neuts appeared. Not going to happen. In highsec, this means the end of the around the clock POS-parked AFK Orca booster. The Rorqual in null or low and the Orca in high sec will need to be huddled up with the mining vessels in a belt or anom. Reaction has been interesting and predictable. The risk versus reward analysis has been slanted. Yes, the mining boosters in a POS were not at risk, but those of us fielding those safe boats usually had very expensive assets very much at risk with little defensive capabilities. Also a fair amount of talk about how Orcas and Rorquals aren't engaging to pilot, so the new system will force the owner to interact with the ship as it's boosting. Nice, but the level of interaction is ridiculously low - it's basically token interaction amounting to busy work. Why treat mining as if it was PvP? Trading is risk free with respect to ship loss (no, transporting is hauling, not the act of trading) as is industry. Those two activities should be moved to destructible vessels or structures if we're going to be consistent. But there's a deeper thing going on with respect to mining: a long standing prejudice against the profession and that prejudice, originally from the PvP community, is bundled with assumptions about mining that are sometimes inaccurate, if not downright false. 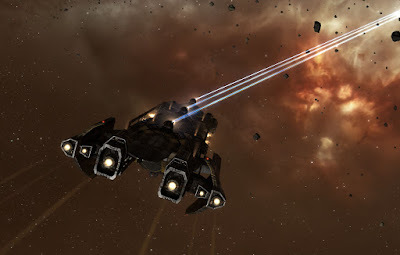 If CCP were to apply the dual ideas of penalizing passive mechanics and rewarding active player engagement to resource harvesting in EVE Online, I suspect many who have made fortunes with the current AFK-friendly mechanics would vigorously oppose such changes. Imagine if mining under the current simple mechanics generated only half of their present yields (or perhaps even less) - and that higher levels of production required more frequent player interactions during the mining process. These interactions could be in the form of some type of optimizing mini-game (an idea that Lockefox dislikes), or other type of "fine tuning" that requires ongoing player input. In other words, miners would have to actually pay attention and issue commands throughout their mining routines, in order to maximize yields and potential income. Multi-box miners actually do pay attention. Multi-box miners actually do interact with the mining process - a great deal in fact. Use six Hulks in a high sec belt and see for yourself the amount of interaction required to keep those lasers running. AFK mining? Sometimes I wish. It's a pain to warp the crew to a POS to take a bio or deal with kids. Is mining a satisfying solo activity? Who can say? Matter of opinion. I certainly see a large number of solo miners in highsec, and some of them spend quality time at it day after day. If they're not enjoying it, it's a sad waste of their discretionary leisure time. Imagine if we diehard miners were tasked with revamping PvP. Forcing the mining boosting ships on to the field probably will improve the game play of some, just not the miners. In high sec having the Orca in the belt isn't a big deal as most of us do that already. But in low and null the Rorqual will really have only one main job - bait. 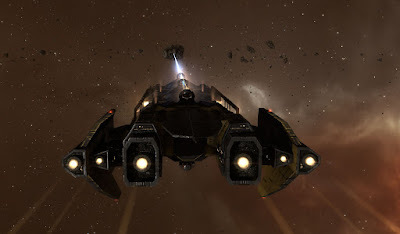 Another problem for both high and null sec miners is that this will spell the end of standing mining fleets which the more casual miner can join and receive the same boosts as the serious multi-boxer. It will also work to the detriment of large corps and alliances who spread out in a system to mine multiple belts or anomalies. Of course miners complain about these changes. PvPers would complain about proposed changes that they felt negatively impacted their area, same with traders and industrialists. The question that CCP hasn't answered satisfactorily is how do these changes really improve game play from the point of view of those who spend most of their time affected by them? The Hulk is losing one of its laser hardpoints but hey, it can theoretically be fit for added yield and the cycle time is being reduced. Miners don't pay attention? Miners don't interact with the mining process enough? Wrong. 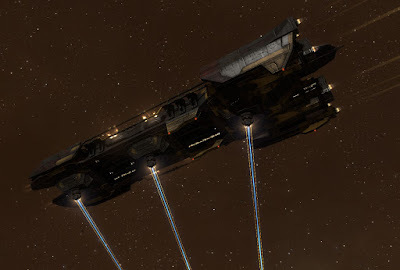 But what's amazing about the Hulk change is the reason for it given by CCP: In 2012, CCP Tallest "... asked the art team to make a note that next time the Barges and Exhumers were up for a regularly scheduled visual refresh they should be unified at the same number of strip miner hardpoints. [link]"
Unfortunately for all, he forgot to include in his note the reason why.